When it comes to running a marathon and the weather, I live by the following expression: You can choose your race, but not your race day. While 30,000 of us chose to run the 122nd Boston Marathon, we did not have a choice in the fact that it would take place on April 16, 2018. And what a race day it was. Heading into Monday’s race I like to think that I was prepared and had trained for a moment like this. I’m a strong believer that when it comes to preparing for a marathon, you need to get out and train in all types of conditions. This way when race day arrives, you’re not facing a situation for the first time. When Monday-like conditions present themselves when training, more often than not, you sit that day out. Who in their right mind would willfully subject themselves to pouring rain, gusting headwinds, and cold temperatures for 26.2 miles? On Monday we had no choice in the matter. No wind, rain, or temperatures in the 30’s and 40’s was going prevent this race from going off. One of the most common questions I’ve been asked since the race is “didn’t you just want to give up?” Of course, my answer was no. I like to think that there is no way I’d ever quit a marathon, unless it involved being carried out on stretcher. As soon as the gun went off and I started running, I realized that the key to getting through this year’s Boston Marathon would be that I would have to give in. Soon after the start, it became clear that this was going to be a Boston like no other I had run before. I had no choice but to accept the situation. While I had done my part to try and neutralize the elements by putting duct tape over my shoes, donning a poncho, and wearing a hat and running pants, all of which I had never done before, by mile 2 my feet were soaked and by mile 5 it was clear the rain and wind were here to stay. I decided to incorporate the conditions into my race plan in terms of my approach to and expectations for the miles that lay ahead. As the race continued and the conditions only seemed to worsen, my determination to power through them only increased. Every marathon presents its own set of challenges, but these were unlike any I had experienced before. The conditions were a challenge I not only had to meet but overcome, and I drew strength from knowing that I was facing this challenge head-on. In my eyes I was winning because I didn’t back down. I pushed through each mile with the same maximum effort I would had given had the conditions been “ideal”. What ultimately powered me to the finish? Pure grit. By mile 25, it was clear that I had not and would not let these conditions stand in the way of me getting across the finish line. Each waterlogged step was getting me one step closer to my goal. It was not only the thought of getting across the finish line that motivated me, but also all I had endured to get there. 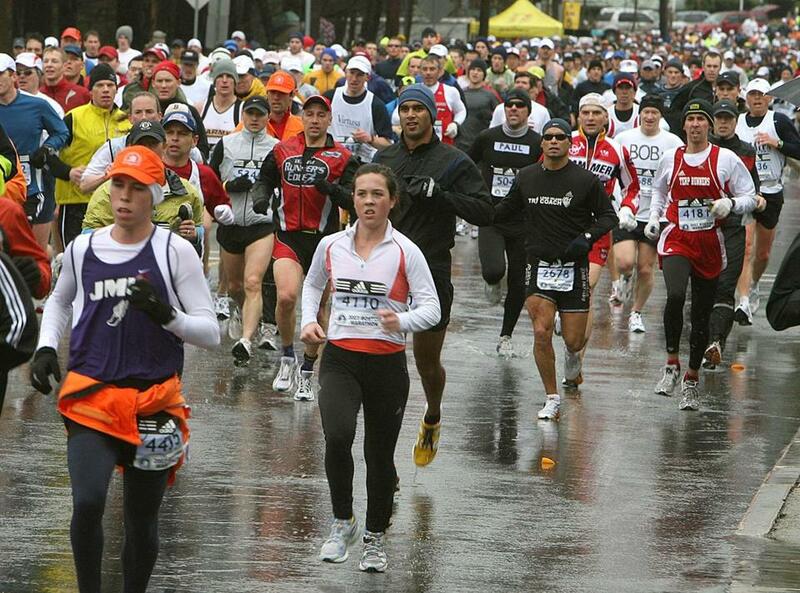 This was no ordinary Boston Marathon; this was a true test of will. Even on ideal days, Boston is an incredibly challenging course. Monday took things to a whole new level. My splits may have been increasing and my pace slowing as I approached the finish, but I still felt strong. What got me through this race was the fact that it was actually making me a stronger runner. I passed the test, and set a new personal standard for mental and physical toughness. What made Monday’s race so great, and yes, it was great, was that we collectively demonstrated the power of the marathon. We did not give up. We showed how much strength, passion, resolve, and grit marathoners possess as a community. Most people would never endure conditions like these for 26.2 miles, but as marathoners it’s what we do. We set goals. We train. We run. On days like Monday, we demonstrate that we will let nothing stand in the way of what we have set out to accomplish.